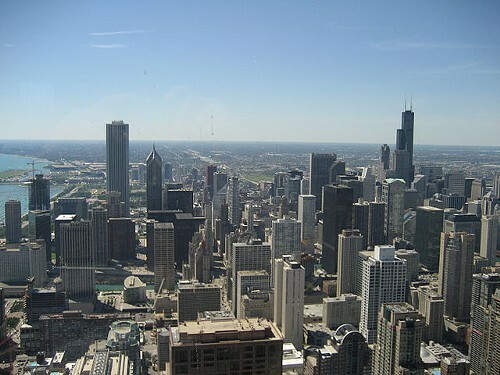 "To me, complaining about corruption in Chicago politics is like complaining about the color of the sky. It's just pointless. It's kind of a fact of life. "And I'm not saying that's a good thing—obviously. I've just grown up with it and, you know, Mike Royko used to write about it all the time. That's kind of the way it is. You kind of hope it's getting better . . ."
Fatalism verging on heresy! I thought. Whoever the WBEZ talking head was who said that, he should be ashamed of himself! Just then I spotted a free parking place, so I heard no more of this conversation. But the note of defeatism from a local political pundit was something new and troubling, and I found myself a day or two later still shaping a response. Is the struggle against corruption in Chicago a Sisyphean labor? Perhaps it is, but recall what Camus had to say at the end of his essay on the subject. Sisyphus got nowhere rolling his rock uphill, but what of it? "The struggle itself toward the heights is enough to fill a man's heart. One must imagine Sisyphus happy." I imagine Sisyphus happy. I imagine Chicago journalists so happy they kiss the ground Ryan and Blagojevich and Vrdolyak and Medrano (I'm leaving out a few names, maybe hundreds) walk on. If in the 40-some years I've been a journalist in Chicago journalism hasn't made a dent in our city's political corruption, neither has corruption made a dent in our journalism. Corruption and the war on corruption are the city's yin and yang; their duality is the air we breathe, the reason so many journalists arrive here and never want to leave. Finally I went online and found the conversation preserved on the WBEZ website. It had been waged on Afternoon Shift last Thursday, and although I hadn't misheard what the man said about local corruption, I'd been seriously ignorant of the context. This hadn't been a serious discussion of the rot at the heart of the city. It was folkloric chitchat about authenticity. The speaker was Joel Reese, a former editor of Time Out Chicago who had just posted on the TOC site a list of "quintessential rites of passage for any true Chicagoan." He'd come on WBEZ to talk about them, and to field calls from listeners proposing their own. "Tom" in Lakeview called with his two cents' worth, asserting that to become an authentic Chicagoan "you have to become completely and I mean completely immune to the staggering amount of corruption that surrounds city government and state government every day. People here accept it as standard operating procedure. I think in any other city Tim Novak and Chris Fusco at the Sun-Times, they would have been nominated for sainthood or something." Reese replied with his comment about corruption and the color of the sky. The second time around, his remarks no longer sounded like a considered opinion on the state of the city. They were a way of telling Tom I feel your pain and moving the program along. But by now I'd given the matter too much thought to let it drop. I thought about the clash between the wheeler-dealers and crusaders of Chicago—how there's less fear and loathing to it than meets the eye. Did you know these hostiles sometimes fraternize? We'll leave Novak and Fusco out of it (they're pretty relentless), but here's a video I've posted before—of John Kass and Rahm Emanuel getting along with disconcerting ease. And a well-connected friend who hears a lot of stuff passed along a resonant piece of gossip. A prominent local reformer got himself into some serious trouble, police blotter trouble, the kind you can't walk away from but maybe—just maybe—you can see to it no one will ever hear about. So the reformer, a pillar of Chicago's end-the-shenanigans community, called a leader of the shenaniganists with his problem and the problem went away. What this story tells us is that yin and yang are not simply opposing forces but also complementary forces. We might want to think of Chicago's media and political establishments along the lines drawn by the elegiac Renoir film Grand Illusion to sketch the French and German officer corps during World War I. Our two camps are the ultimate frenemies, nominally hostile tribes that understand each other perfectly and share what the lower orders cannot—the certainty that together they make Chicago Chicago and that our vast city would be simply a bigger Des Moines without both of them. Down through the years "reformers and politicians animated and defined each other by their opposition, an us-against-them hardening of attitudes. The scorn with which politicians beheld reformers is suggested by the local epithet goo goos, short for good-government types . . . Nevertheless, reform and corruption were curiously interdependent. A reciprocal relationship developed between reformers and corrupt politicians who were sometimes, in their own way, equally public-spirited." Some reformers, I'd say, the ones not impossibly righteous, and some corrupt politicians, the ones who when they're not enriching themselves take their jobs seriously. Good and evil thrive in Chicago in various forms and to various degrees; collectively, their gift to Chicago is its complex yet stable ethos. If this spiritual ecosystem is to be sustained, people whose duty is to disapprove of corruption must go on disapproving. They can't just throw up their hands and say the hell with it—that would throw off everything. Reese said doing that tempts him. But I'm sure he didn't mean what he said.